Otto Fritz Meyerhof (April 12, 1884 - October 6, 1951) was a German doctor and biochemist of Jewish descent. 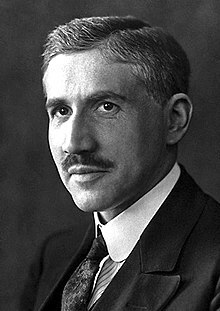 He won the 1922 Nobel Prize in Physiology or Medicine, for finding out how oxygen makes chemical changes in lactic acid in muscles. In 1940 Meyerhof fled to the United States, where he continued his academic career. ↑ "Biography of Otto Fritz Meyerhof". The Nobel Foundation. Retrieved 2009-01-05. This page was last changed on 21 January 2018, at 04:20.